Indian football’s goal machine Sunil Chhetri struck a brace to help the country stunningly outplay Thailand 4-1 and record its first victory in the Asian Cup since 1964 on a historic night on Sunday. Playing in his second Asian Cup and 105th match, Chhetri scored in the 27th (penalty) and 46th minutes for his 66th and 67th international goals. 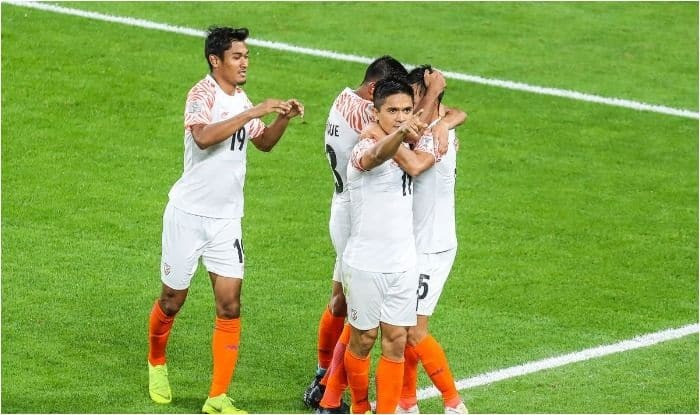 Midfielder Anirudha Thapa and second-half substitute Jeje Lalpekhlua then struck in the 68th and 80th minutes to completely outclass Thailand at the Al Nahyan Stadium in front of sizeable Indian supporters. With his two strikes, the 34-year-old Chhetri went past Argentine superstar Lionel Messi, who has so far scored 65 goals from 128 matches. Portugal superstar Cristiano Ronaldo is the highest scorer with 85 from 154 matches. Thailand captain and striker Teerasil Dangda pulled one back for his side in the 33rd minute of the Group A match. A draw in either of the two coming matches against UAE and Bahrain could see India through to the knockout round. Ranked 97th in the FIFA charts, India went into the match eyeing a win against their 118th ranked opponents, but the scoreline and impressive show by the players, especially in the second half, was unexpected. Thailand were the better side in the first half with an overwhelming 70 per cent possession and more shots on target. With three players who ply their trade in Japanese top-tier J-League, the South East Asian country dictated terms with their fluid and neat interchange of passes to build their moves from their own half. India had to do a lot of defending. India had few such neat moves and lost the ball often. They had very few quality crosses from the flanks and goalkeeper Gurpreet Singh Sandhu was far busier than his Thai counterpart in the first half. But the complexion of the match completely changed in the second session with India scoring three goals in stunning fashion to take the match out of Thailand’s reach. They suddenly became a team which can stitch neat passes and build goal-scoring moves. Chhetri, who is the only one in the current squad to have played in the 2011 edition, also become the highest Indian scorer in the Asian Cup, surpassing Inder Singh, who struck twice in the 1964 edition when the country had finished runners-up. Taking part in their fourth Asian Cup, this was India’s third win in 11 matches. The country won two matches and lost one in the 1964 edition in Israel, competed by just four countries, then lost three and drawn one in 1984 and were beaten in all their three group matches in 2011. India gave the 21-year-old Pune City FC player Ashique Kuruniyan a start over the likes of Jeje Lalpekhlua and Balwant Singh, and he did well while playing at the hole just behind Chhetri. He earned the penalty for India after a quick throw from the left flank. Ashique’s shot deflected from the Thai goalkeeper and hit defender Theerathon Bunmathan’s hand and the Hong Kong referee pointed to the dreaded spot. Chhetri stepped up and sent the Thai goalie the wrong way to give India 1-0 up. Thailand equalised within six minutes with captain and striker Teerasil Dangda connecting a quality free-kick to head over Gurpreet and into the India net. Thailand had at least a couple good chances to score in the 22nd minute and 25th minutes. In the first, Gurpreet was beaten off another free-kick but central defender Anas Edathodika had the last touch to concede a corner. Anas again made a last-minute clearance on the top of the box to deny a Thai player from taking the shot with only the goalkeeper to beat. Chhetri also had two more shots in the first half. The first from a close range, after a link-up with Ashique, was blocked by a Thai defender in the 37th minute and his second attempt five minutes later, went wide. But just a minute into the second session, India scored a world-class goal through Chhetri and that began the turning of the match on its head. Nimble-footed winger Udanta Singh ran down the right flank in a flash and his superb cross was connected by Chhetri on the top of the box with the star striker hitting the top of the net. India’s third goal showed how much they have improved in the passing system with three players involved in the build-up. Halicharan Narzary sent a pin-point pass to Udanta who rounded up the Thai goalkeeper and left the ball for Thapa to chip over a couple of defenders on the top corner of the net. Lalpekhlua then scored two minutes after coming into the field. He was fed by a nice pass from Narzary again and his chipped shot from the top of the box beat the goalkeeper all ends up.